Developed with Francisco Goya for early planing, great upwind ability and strong on-shore performance. The main difference with this modern quad set is the center fins increase the size while the side fins remain the same (8cm). The center fins are designed with a little more tip allowing for smaller side fins. Available in US base centers with the option of mini-Tuttle, US, or Slot box side fins. 14cm-18cm centers. The AR is a model to cover all conditions. Side-shore wave, on-shore wave, off-shore wave... It's the fin that does it all. This is accomplished by designing the smaller sizes with wave sweeps and bringing every size more upright to freewave shapes as they get bigger. Speed and early planing are prominent characteristics of this fin. Maui Fin Company's new "Racing Bullet" developed with Kevin Pritchard and tested in all the PWA events. This fin boasts a new faster profile for exceptional early planing in the bigger racing sizes and incredible top end speed throughout the size range. CNC shaped G-10. Available in Tuttle and Power base from 28cm-52cm. 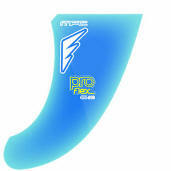 New outline, new profile, new materials, the LIQUID PRO is the new freeride/freerace concept by MFC. The profile is generated by the SL and RC models, with incredible top speed, great planning and maneuverability. Ideal for Freeride/Freerace conditions, as well as flat and choppy conditions. 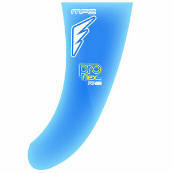 MFC and Kevin Pritchard developed this freeride fin. Kevin, one of the fastest sailors in the world, was looking for a freeride bullet that can also be maneuvered easily. 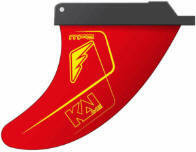 The "K-One FR" follows the concept of the "K-One Wave" fin because of its narrow cord. The speed, early planning and upwind ability are the best points of this fin. This is the fastest fin you'll ever use. Ideal for freeride/freewave conditions. 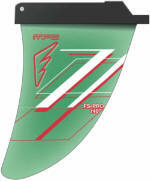 New lay-up for the most sailed freewave fin on the market. This year we also introduce VECTRAN, a new prepreg cloth which is strong, light and very responsive to the torsion needed for our fins. Maneuvers have never been easier! Top speed, early planning and upwind ability are just unreal on this particular model. Ideal for freewave conditions, the 21cm and the 23cm can be also use in wave riding on-shore conditions. 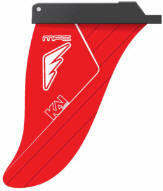 This new generation of G-10 freestyle fin is outlined with a curvier tip to allow easier sliding maneuvers. Plus the new profile accelerates planing for top speed in the first 50-80 meters. Feel free to spin! Available in US and Power base, 14cm-24cm. 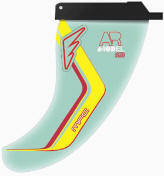 This fin offers a new concept in fin design developed by MFC and Francisco Goya. The material chosen is G-10. The fins are CNC designed and machined by a high precision milling machine. This particular model has a unique and distinguished concept where in the bigger sizes the fin becomes straighter in the outline and rake and faster in the profile. The two sizes that we applied this new concept to are the 24cm and 27cm. 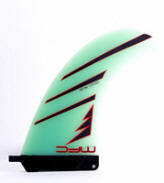 This fin is ideal for wave and freewave conditions. 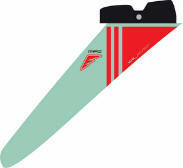 MFC and Kevin Pritchard, wave world champion, developed this new fin concept also in G-10 construction. The straight outline allows for very early planning and radical upwind ability, but the fin is incredibly manoeuvrable due to its narrow outline and cord. The profile is the fastest, generated by our SL model and adapted to this wave model. Ideal for all around wave conditions can be use also for freewave conditions. Twin fin concept, one full year of research and development by MFC together with Kauli Seadi and Keith Teboul, 2 of the most radical wave sailors in the world. This model comes from the outline of the EIGHT, and it has a LEFT and RIGHT fin. In fact it is very important to keep the same fin on the same side to keep the same amount and direction of torsion. The maximum draft of the profile is at 30%, allowing greater carving without penalizing the early planning and the upwind performances. Ideal for wave riding, bigger sizes can be used in on-shore conditions. Sold by the set. 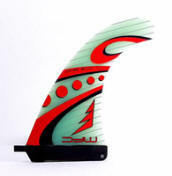 This fin is the exact copy of our SL and RC models designed with Micah Buzianis. 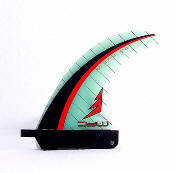 The fin is very fast, and the upwind performance and the early planing are just incredibly good for this kind of fin. A 45 degree rake allows weeds to easy slide off. Maneuverable, fast and easy to ride; the rake allows weeds to slide off easily in any conditions. The profile is the same as our 211 Series fin line, and the material we choose for this model is G-10 CNC foiled. Speed and Glide are key for this fin. We tested many different outlines and foil sections to gain as much speed and natural glide as possible when racing downwind. With our current design Kai just won the Gorge Naish SUP Challenge Course Elite Race. Fin comes in 22/24/26/28/30cm. Available in US Base. With a narrower tip and a new profile section this is our most versatile fin as it can be mixed with different side fin designs and sizes customizing the ride for every rider. Developed by Kai for his Quad boards. Fin comes in One Size (10cm). Available for Future�, or FCS� tabs. A very maneuverable design and concept for your everyday surf session to the most extreme conditions. Fin comes in 3 sizes: 12/13/14cm. The focus in this design is on tight turns and lots drive for the various waves around the world. This is the fin choice of Kai for Hawaii Wave events as well as Fiji, France, Mexico & Brazil. Available for Future�, FCS�, and US tabs. A very simple and efficient design allows the side fins to be used either as Quad Side Fins or Tri Thruster Side Fins. Fins come in 3 Sizes: Small (11cm), Medium (11.3cm) or Large (11.6cm). Available for Future� or FCS� tabs. 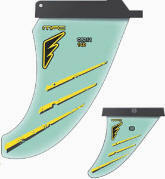 New polyester (23cm-28cm) or vinylester (30cm-36cm)construction for the most sailed freewave design on the market. These materials allow for lower pricing, provide a softer flex and feel, and make ding repairs cake. Maneuvers have never been easier! Top speed, early planning and upwind ability are superior on this model. Ideal for freewave conditions, the 23cm and 25cm can be also use in on-shore wave riding conditions. Available in US Box and Power Box. With the evolution of center fins being designed with a little more tip allowing for smaller side fins, MFC has simplified the sides to two sizes, 8cm or 9cm, with the option of Mini-Tuttle or Slot Box. Polyester construction.